The orange glow reminds me of the heat lamps that used to keep the baby chicks warm in the shed behind our house when I was growing up. The all-encompassing warmth surrounded the new, young bodies as they outgrew themselves and aged quickly. Here, heat is implied, similar to the heat that settles on the bottom floor of the jungle, only to become a thick blanket when the sun sets. In the Midwest, the heat is exotic, a growing legend. Only coming to burn the winter skin rather than darken it. But in the photographs, the orange glow desaturates the jungle, masking the presence of the white man amongst the remote Sawiyano Tribe of Papua New Guinea. While reflecting on travels abroad, This One’s For Me displays the generosity of confrontation, and the cyclical conflict of searching for the “new.” The congregation captures a collective gaze, while more intimate portraits perimeter the room, reminding us we are being watched, as we are watching them. 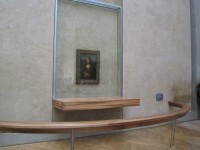 A photo of the Mona Lisa at the Louvre, anticipating the daily crowd, neighbors a portrait of a woman in the jungle, evoking significantly different forms of rarity. As a symbol of treasure and mystery in our society, the Mona Lisa mimics our relationship to indigenous tribes, as we lust over their exoticism. We idealize the remote parts of the earth that they occupy. We strive to take a step backward as we compare their growth to our own. We fight wars for them, steal them and buy their mountains. They are treasures that we try to keep and preserve. We examine them, and realize we are only examining ourselves.